On Tuesday, Myanmar leader Aung San Suu Kyi finally broke her silence on the Rohingya crisis, which the United Nations has called a textbook case of ethnic cleansing. Kyi, Myanmar's state counsellor, had been facing criticism for failing to publicly comment on the plight of the Rohingya or even urge the Myanmar Army to restrain itself. Kyi spoke for 30 minutes, requesting support from the global community to help find a solution and even seemed to offer a way back for some Rohingya who, fearing for their lives, fled Myanmar. However, if Kyi hoped that her speech would temper her critics' ire and give her some breathing room, she was sorely mistaken. Kyi was roundly criticised by analysts, world leaders, and even fellow Nobel prize winners. "Since 5 September, there have been no armed clashes and no clearance operations. We are concerned to hear that numbers of Muslims are fleeing across the border to Bangladesh. We want to find out why the exodus is happening. We would like to talk to those who have fled, and those who have stayed — more than 50 percent of villages of Muslims are intact and are as they were before the attacks took place." A report in the Australian Broadcasting Corporation pointed out that Kyi's claim that there were no armed clashes or clearance operations directly contradicts the accounts of survivors and journalists. Scanning the speech, what catches the eye is that nowhere did Kyi even say the word 'Rohingya'. 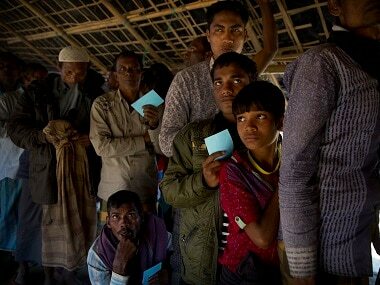 Kyi merely referred to the refugees as Muslims of Rakhine State, as the report observes. A report in CNN also pointed out that Kyi stating that the government wanted to find out why the exodus was occurring was "peculiar", especially as Kyi had repeatedly referenced the official report commissioned by the government and compiled by former UN secretary-general Kofi Annan which lays out exactly why the refugees are fleeing. The report also called several of the claims Kyi made as "somewhat dubious" and stated that they appeared to directly contradict the report. "Myanmar is prepared to start the verification process of refugees who wish to return. Those who have been verified as refugees will be accepted without any problems and with full assurance of security and access to humanitarian aid." According to a report in BBC, while US Secretary of State Rex Tillerson told Kyi he welcomed her statement that refugees would be allowed to return after verification, he urged her to facilitate humanitarian aid and "address deeply troubling allegations of human rights abuses and violations". French president Emmanuel Macron, taking issue with Kyi's speech, stated at the UN Assembly that "the military operation must stop, humanitarian access must be guaranteed and the rule of law restored in the face of what we know is ethnic cleansing", BBC reported. "We feel deeply for the suffering of all the people who have been caught up in the conflict. Those who have had to flee their homes are many, not just Muslims and Rakhines, but also small minority groups. The government is working to restore the situation to normalcy." A report in Vox stated that by refusing to directly criticise Mynanmar's military, Kyi took a vague approach to the humanitarian crisis and that although her fellow Nobel laureates have been begging her to condemn the violence for weeks, her words came up short. Speaking to the New York Times, Muhammad Yunus, the Bangladeshi social entrepreneur and recipient of the prize in 2006, held nothing back. “She should not have received a Nobel Peace Prize if she says, sorry, I’m a politician, and the norms of democracy don’t suit me. 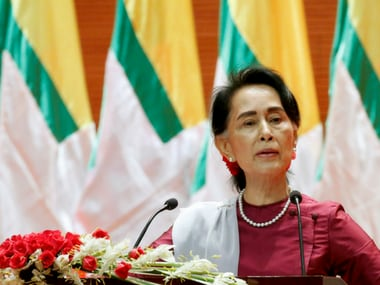 The whole world stood by her for decades, but today she has become the mirror image of Aung San Suu Kyi by destroying human rights and denying citizenship to the Rohingya. All we can do is pray for the return of the old Aung San Suu Kyi,” he told the newspaper. An op-ed in The Australian called the speech "a miserable attempt to shift blame away from the Burmese military, to justify the unjustifiable and to wash her hands of one of the most appalling crimes against humanity in our region in decades." "There are those who argue Aung San Suu Kyi should be obliged to return her Nobel Peace in the wake of this appalling episode. I’d say she can keep it. The list of winners reveals some of the more appalling characters in modern history and Aung San Suu Kyi is in good company," the op-ed argued. In the wake of her tone deaf speech, it's hard to argue otherwise.